This little trinket is not a new find, but still one that I really like and use often. 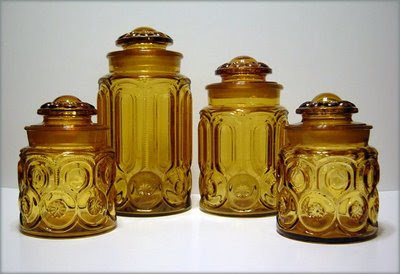 Italian glass company Bormiolio Rocco supposedly dates back to the 1800s and even though this is a new piece, it feels kind of vintage because of its simple shape. These come with an airtight lid (mine is blue) and are perfect for storing liquids in the fridge. 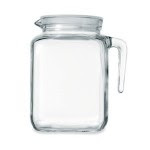 It comes in handy as a cream pitcher and you can easily write the expiration date on the glass with a dry erase marker. While these aren't very expensive brand new ($10-20), I got mine for $1 at a yard sale...Surprise, surprise! Among the weekend's yard sale treasures were some great boutique candles (one of my current obsessions) for cheapity-cheap. 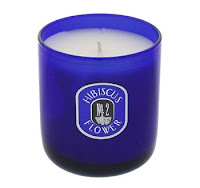 First, a still-in-the-box Capri Blue candle by Aspen Bay. The one I got smells of Peeled Navel Orange and it is heavenly. It is the perfect bedroom candle because it is fresh and light, just the right scent to mingle with the heat of summertime. These retail at Anthropologie for around $18 and I got mine for .50 cents! yay! Next, this Yankee Candle in the largest size (retail $24.99, yard sale $1). double yay! These might not be considered ' boutique' because they are so mainstream, but I say costing twenty-five dollars bumps it into that category. 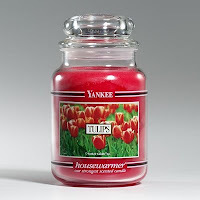 This one smells just like fresh tulips. I'm so glad the recession hasn't impaired my need to surround myself with good smells...even if some people think a candle is a generic gift. From me to me, I'm always happy to get one! This weekend's yard sale excursion turned up a real treasure. At a local church sale as I was browsing a large selection of glassware and other collectibles, I spotted a stack of beautiful dishes. They were precariously stacked and taped together so it was hard to tell which pieces were there, but I knew from one look that I loved them. Pale robin's egg blue with a platinum rim, I didn't care if they weren't particularly valuable because for the price ($8 for all), they were gorgeous enough to be worth it. Of course when I got home I immediately looked them up online. How shocked was I to find that they are Franciscan China from the mid-1950s. Their pattern is dawn and they are in perfect condition. 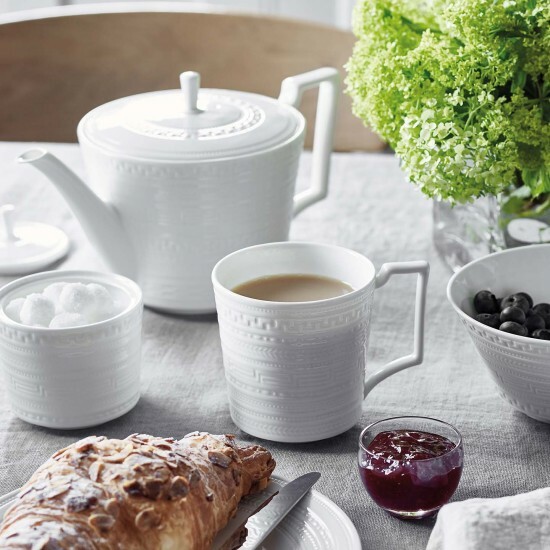 I have three complete place settings including darling little cups like the one pictured. So my $8 investment is actually worth 20x that. Not a bad little gamble I have to say. In 1953, my grandmother was a senior at Oak Ridge High School. Along with all other young lady Wildcats graduating, she was invited to Loveman's Department store to get her sterling silver spoon. Each of the graduating senior girls wa s gifted a spoon in the pattern of her choice, a gesture which would hopefully create a relationship and a repeat customer as the girls were building their silver sets. Patsye chose International Silver's brocade. When she gave her silver to me last year her collection had grown to around fifty pieces. Each one represents a birthday, Christmas or annive rsary gift from my grandfather to her and a happy memory of receiving it. While the value will most likely increase with time, it will always be overshadowed by the sentimental worth which will grow and grow. I hope to add to her collection and pass it along one day with more pieces and more stories behind them. Years ago, one would have to be a knowledgeable antiques dealer or appraiser to identify the origin and value of your antique treasures. These days, all you need is a computer and dedicated ethernet services that connect you to the world wide web. With the power of Google at your fingertips, you can locate and identify just about any attic treasures you may have. This weekend, my folks and I whiled away the hours of an afternoon playing our own version of Antiques Roadshow, going through my mom's china cabinet and looking up different pieces of her collection to see just what they were and how much they might be worth. Of course it helps to have a house full of antiques at your disposal. We were able to identify a set of Hazel-Atlas glassware in Moroccan Amethyst that belonged to my dad's mom just by Googling 'purple vintage glassware.' We also found out that the vintage brown canister set (that lives above the microwave) is the Moon and Stars pattern made by Smith Glass Co. We may not have a Rembrandt in the attic and score that million dollar find, but we have a ton of other stuff. And it can be pretty neat to learn how things ended up in the china cabinet. Are you a collector of things like this? Have you ever thought about taking your collection on the Roadshow to see just what it is worth? You never know what treasures you might have! Sit down, you're sinkin' the boat! This little treatie helped me to enjoy a belated birthday celebration, beachside at a favorite seafood eatery, Aunt Catfish. 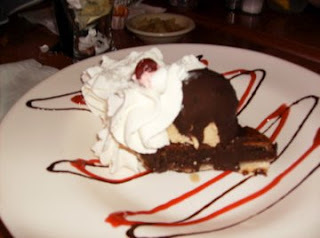 Fudge pie, coffee flavored ice cream, a rich chocolate shell and real whipped cream!! Aptly named "the boat sinker," there was enough sugar to go around so that everyone at the table got a taste. Even the non-foodies got a littl e excited! I have an 'after' picture of the plate licked clean if you don't believe me! I can't help but get drawn into the commercial aspect of Easter. Even though I could never forget or lessen the importance of the real reason for this holiday, I have to say that all the pastel colored sweets speak my name loud and clear. And that doesn't even begin to cover the sweet love in my heart for woodland critter shaped slabs of chocolate...bring on bunnies, squirrels, lambs, gophers, etc. Maybe I should say that this stuff is more a symbol of Spring to me, instead of a symbol of Easter. 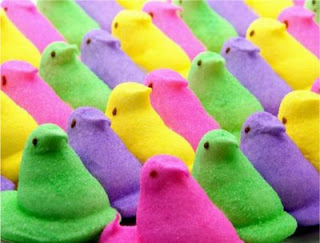 Either way, I hope that those of you who love Peeps get a basket full of them. I'll give you all of mine too! As a curly-haired person, I live my life in a constant pursuit of the next great product to de-frizz and perfect my tresses. 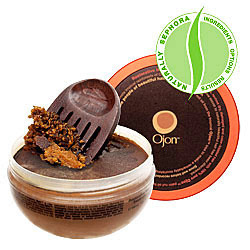 When I read about Ojon's Restorative Treatment, I knew I had to have it. Thankfully, I tested it before making the purchase because no matter how great it might have made my hair look, it smelled like stale cigar smoke. Or as my trusted scent advisor put it, "like a pretty girl who smokes and covers up the smell with lots of perfume." I don't want that, now do I? When I look at my bank statement, it is obvious what category that I spend most of my money on: cosmetics & toiletries. Every ad promising tighter, firmer, glossier, etc. calls out to me and I have to try the product being pushed. My bathroom is filled with every product imaginable, but I do use them or pass them along so someone else can. I found this Philosophy 3-in-1 (brand new) at a yard sale for $1 and now I'm addicted. 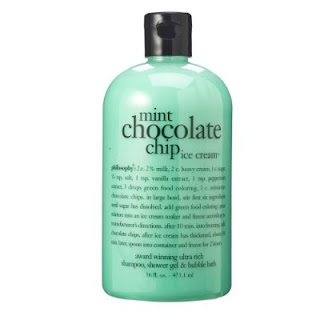 It smells just like my favorite ice cream and it works great as bubble bath or body wash. I probably won't try it as shampoo even though the label says you can. Of course when I run out, I guess I'll have to break down and pay retail for it (unless I stumble upon it again during a bargain excursion). Keeping my fingers crossed! 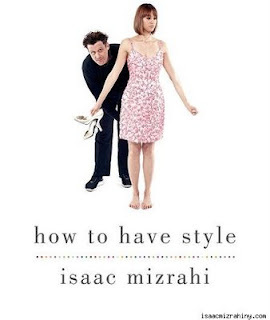 I just finished reading How to have Style by the fabulous Isaac Mizrahi and I am calling it a must-read for anyone who feels slightly blah (or a lot blah) about his/her closet as of late. Speaking of feeling blah, I guess that segues into an introduction of myself and this blog. 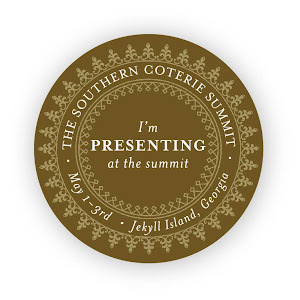 I'm a southern gal living in Knoxville, Tennessee, trying to seek out the lovely things in life. I grew up in a small town but have lived in the big city of K-town since 2000 when I began college at UT to study art history. After that, I decided to go back to school and study communications -- specifically PR. After finishing my master's degree in public relations, I just knew I'd land my dream job right away...fast forward a couple years later to the present and still no dice. I feel blessed to have my current job as a visual media librarian in a university art department, but it's not exactly what I'd hoped I'd be doing after I graduated. At one point, I considered pursuing a degree in library science or even a master's in information technology, but I really wanted to pursue my love of art by getting a masters in PR so I could hopefully work in an art museum. That's how I came to start this blog...as a little creative outlet for myself during a creativity dry spell in my life. Reading Isaac's book inspired me and I think it will inspire you too. I think this book is just the thing to give you a needed boost. It is all about taking what clothes you have and doing more with them. In the beginning of the book is a neat little set of questions for the reader to answer and ponder. I am in the process of overhauling my own closet and this book was a great little how-to manual for along the way. And speaking over overhauling, I'm also working on overhauling my life...one blog post at a time. Thanks for joining me and I hope you'll stick around for the journey.